“Ikan Bakar” is Malaysian grilled fish. 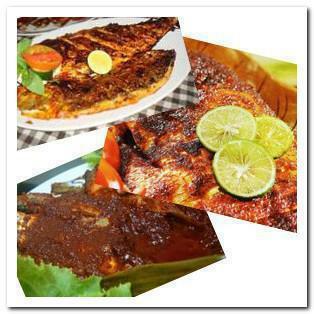 Fish or seafood is marinated with spices, sambal belacan and then grill. Sometimes a banana leaf is inserted between the seafood and hotplate, banana leaf release great aroma after getting heat from the hotplate and seafood. Some of the popular forms of seafood besides fish include squid and stingray. Blend all chili paste ingredients in a food processor until smooth. Heat cooking oil in a saucepan, add chili paste, keep stirring and saute until fragrant, approximately 5 – 10 minutes. Meanwhile, grease a baking pan and the banana leaf or foil. Place banana leaf or foil on the baking pan. Place the fish on the greased banana leaf or foil. Pour all the chili paste over fish, fully coated the fish with chili paste. Grill fish in a preheated oven at 180°C for around 25 minutes or until cooked. Flip the fish once after 12 minutes. Check regularly and keep grilling until cooked. Squeeze lime juices over fish.